Visitor Lanyards are the ideal way to ensure everyone in your building has permission to be there. 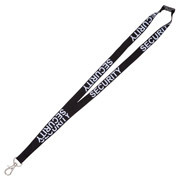 We have a selection of pre-printed lanyards for you convenience with common titles that used often by organisations. We have ready-made lanyards for VIP staff, security, visitors and contractors. Don’t waste time getting artwork ready when they’re already printed for you. In fact we can almost certainly do a same or next day dispatch depending on when you order.